It was time consuming process. It was difficult to maintain records properly. It was altogether a less efficient system. Cost of stationery incurred was also high. More personal required accomplishing the task. In all, the old system was an inefficient and confusing system. • No maintenance of records required. • Minimum cost of stationery. • Now task can be performed with minimum manpower. Selection of an appropriate Operating System and Programming Language is very important for any project. The selection basically depends upon the nature and requirements of the Project. MS-Windows is a Graphical User Interface (GUI) operating system. Windows provide a multitasking environment, enabling the user to run several applications at a time. Since Windows use a consistence windowing and menu structure for its applications, windows applications are easier to learn and use than traditional DOS based programs. Windows offer relief from many of the tedious and painful tasks involved with developing applications that incorporate GUI’s. Windows and applications designed for windows offer many advantages over other GUI’s to both the user and programmer. Users enjoy the benefits of features such as point-and-click capabilities and multitasking. Programmers find the device independent graphics and enhanced memory management, very helpful. Windows and its applications have consistent user interface. Because most users work with several different software packages, each with it’s own interface, the consistency of user interface’s design is very important. Each window in the windows environment contains some basic features. Since these features are consistent among all applications user can adapt new applications more conveniently. Windows user gets all benefits from graphics-based images that represent applications and data. Since Windows is GUI graphic images represent physical data structures such as files, applications, windows and directories. We can manipulate these physical data structures with a mouse by selecting, double clicking and dragging and so forth. Double clicking an icon (a small picture that represents an application), is easier and faster than typing cryptic commands to navigate directories and then typing the name of the file to launch the program. WYSIWYG is a major advantage to windows user. It stands for What-You-See-Is-What-You-Get, i.e. text and graphics appear on printing just the same as they appear on screen. Most non-windows soft wares use the ROM-BIOS character sets, which are not proportional and have no direct co-relation to the font used by an application, the text displayed on screen usually does not corresponds to resulting the text output on the printer. With the WYSIWYG features, however, windows can treat text as a series of graphical images that are drawn on the screen, as they will appear when printed. Windows also provide the very important capability of multitasking. Because several applications can run simultaneously we do not have to save the file we are working on and exit the current application to enter the other applications. We can simply keep several programs running side by side and switch among then at our will. Memory Management capabilities enhance multitasking. Windows provide access to all available memory resources, so we can optimize the system more easily. C++ is one of the most popular languages due to its power and portability. It is available for different operating system such as DOS, OS/2, UNIX, WINDOWS and many others. 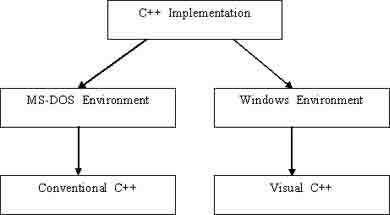 C++ programs when implemented under windows are called Visual C++ programs. Therefore, there is no difference between C++ and Visual C++ programs in terms of programming but the difference lies in terms of implementation. A C++ compiler designed for implementing under Windows is known as a Visual C++. A C++ program running under MS-DOS will also run successfully under Windows. This is because, the rules of programming are the same; only the environment of implementation is different and is shown below. A C++ programmer can easily become a Visual C++ programmer if he knows how to use the implementation tools of his Visual C++ system. Possibly why C seems so popular is because it is reliable, simple and easy to use. (a) Problem oriented languages or High-level languages: These languages have been designed to give a better programming efficiency, i.e. faster program development. Examples of languages falling in this category are FORTRAN, BASC, PASCAL, etc. (b) Machine oriented languages or low-level languages: These languages have been designed to give a better machine efficiency, i.e. faster program execution. Examples of languages falling in this category are Assembly language and Machine language. C stands in between these two categories. That’s why it is often called a Middle level language, since it was designed to have both: a relatively good programming efficiency (as compared to Machine oriented languages) and relatively good machine efficiency (as compared to Problem oriented languages). C language posses the powerful low-level features of second-generation languages, like pointers, memory allocation, bit manipulation, etc. It also supports conditional constructs, loop constructs, a rich list of operators and a variety of data structures as in third generation languages. The combined features of second and third generation languages make C language a very powerful and flexible language. These features of C language make it possible to use the language for systems programming, like development of compilers, interpreters, operating systems, graphics and general utilities, and also for a host of applications in the commercial environment. C language is so powerful and flexible that C compilers are being written in earlier versions of C language. Also, other language compilers, databases, spreadsheets, word processors, etc. are being developed in C language. C language like other languages, allows reference to a memory location by a name assigned to it. 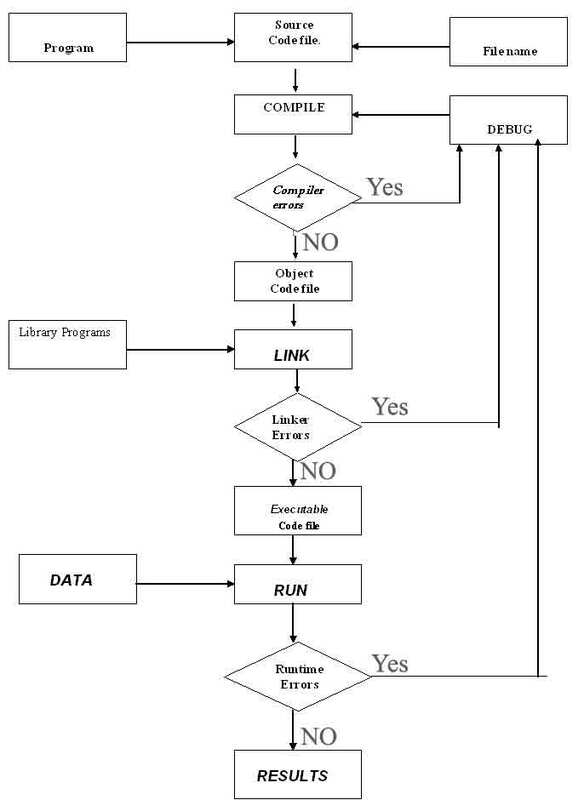 In addition, C allows reference to a memory location by its internal address or byte number, using pointers. In almost all programming languages, memory is assigned to a variable name at the time of definition. C language also allows dynamic allocation of memory i.e. a program itself can request the operating system to release memory for the use of the program at the time of execution. A function may call itself again and again. This feature, called recursion, is supported by C language. Unlike other languages, C allows manipulation of data in its lowest form of storage – BITS. For example, consider multiplication of a number, m by 2. A familiar method to do so is to compute (m*2). Another method is to shift the BITS of memory location m to the left by one position as shown in table. C++ is an object oriented programming language. It was developed by Bjarne Stroustrup at AT&T Bell Laboratories in Murray Hill, New Jersey, USA, in the early 1980’s. Stroustrup wanted to combine the best of Simula67 and C language and create a more powerful language that could support object oriented programming features and still retain the power and elegance of C. The result was C++. Therefore, C++ is an extension of C with a major addition of the class construct feature of Simula67. Since the class was a major addition to the C language, Stroustrup initially called the new language ‘C with classes’. However, later in 1983, the name was changed to C++. The idea of C++ comes from the C increment operator ++, thereby suggesting that C++ is an incremented version of C.
C++ is the most widely used object oriented language today. It is faster than JAVA, another popular object oriented language, which lacks certain features such as pointers and multiple inheritance. C++ has been undergoing changes during the last few years. They are basically meant to provide better control and conveniences to the C++ programmers. The ANSI/ISO C++ standard committee that reviewed all the changes has standardized several new features. The Standard Template Library (STL) that was developed independently has now become a part of the C++ language. C++ is now called ANSI C++ or ANSI/ISO C++ or simply C++. Programming pandits expect that C++ will replace C as a general purpose programming language because C++ offers significant software engineering benefits over C. C++ is the language of the future. C++ is a superset of C. Mostly what we know about C applies to C++ also. 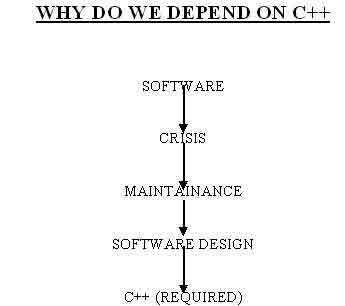 Therefore, almost all C programs are all C++ programs. However there are a few minor differences that will prevent a c program to run under C++ compiler. The most important facilities that C++ adds on to C are classes, inheritance, function overloading, and operator overloading. These features enable creating of abstract data types, inherit properties from existing data types and support polymorphism, thereby making C++ a truly object oriented language. The object oriented features in C++ allow programmers to build large programs with clarity, extensibility and ease of maintenance, incorporating the spirit and efficiency of C. The addition of new features has transformed C from a language that currently facilitates top-down, structure design, to one that provides bottom-up, object-oriented design. C++ is a versatile language for handling very large programs. It is suitable for virtually any programming task including development of editors, compilers, database, communication systems and any complex real-life application systems. • Since C++ allows us to create hierarchy-related objects, we can build special object oriented libraries, which can be used later by many programmers. • While C++ is able to map the real-world problem properly, the C part of C++ gives the language the ability to get close to the machine-level details. • C++ programs are easily maintainable and expandable. When a new feature needs to be implemented, I is very easy to add the existing structure of an object. • It is expected that C++ will replace C as a general- purpose language in the near future. 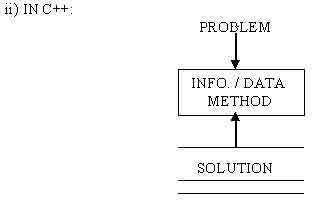 C++ allows to design a software in such a way hat the elements of problem are concentrated at one place rather than scattering in entire program. This allows for easy maintenance of the software. • C requires all the declarations to be made at the beginning of the scope; C++ permits us to make declarations at any point in the program. This enables us to place the declarations closer to the point of their use. • In C, the character constants are of type int. C++ treats the character constants as type char. This is necessary because the compiler needs to distinguish between the two overloaded functions based on their arguments. When writing program in C language, we implement the solution for an instance of the problem. Since it implements the solution, any changes in nature of the problem are not supported and the program doesn’t serve any purpose. The most important drawback of this type of programming is that it is instance dependent. 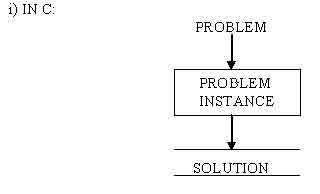 Thus, the complexity of program increases as the number of instances of problem increases. When writing a program in C++ we implement the problem itself as a type so that any no. of instances of the problem can be created on demand. • Since it implements the problem itself, any change in the nature of problem can be instantaneously and easily accommodated in the program. • The most important advantage of this type of programming is that it is instance independent. Thus, he complexity of program isn’t affected as no. of instances of the problem increases. Shopper’s paradise is software designed for ENGINEERS DEPARTMENTAL STORE. The software is designed to take care of sales, purchases, opening and closing stocks maintenance as well as computation and printing of bill. The program provides user with a menu of suite. According to user’s choice the available commodities with their respective rates are shown. Again, according to user’s choice certain commodity with its quantity is entered. After every purchase program asks the user choice for further purchases. With the use of data file handling the bill is prepared. When the user finishes with shopping, an invoice containing details relevant to the system is generated. Outstanding report helps in finding out the payment status of customer and discount/surprise gift for the user. For the users convenience the software has been designed such that there shopping become easy and with ease of time they be able to do shopping via internet. 1. Develop the program (source code). 2. Select a suitable file name under which you would like to store the program. 3. Create the program in the computer and save it under the filename you have decided. This file is known as source code file. 4. Compile the source code. The file containing the translated code is called object code file. If there are any errors, debug them and compile the program again. 5. Link the object with other library code that are required for execution. The resulting code is called the executable code. If there are errors in linking, correct them and compile the program again. 6. Run the execution code and obtain the results, if here are no errors. 7. Debug the program, if errors are found in the output. 8. Go to step 4 and repeat the process again. These steps are illustrated in the diagram. • The customer can get all general-purpose items at his convenience without wasting his time. • They can also purchase those brands, which are not available in their cities. • It is user friendly and appeals to the customers. • User can demand for the desired quantity, as he would not have to carry it home. • There’s no need for opening shop-outlets so space and money is saved. • Not necessary to keep stock all time, it can also be filled as soon s the demand comes. • As there’s not much stock kept so there’s less chances of the stock to get expired. • No need for appointing salesman, cashier etc as this work is done by the project itself. • There is no assurity that the products purchased by customers will be delivered on time. • There can be a misuse of the credit card details of the customer. • The customer may be cheated for the quality of the products purchased. • The non-registered companies are fooling some times customers as they take money but not deliver the items. • The company has no record of the customers, so they can cheat the company. • In case of cheaque payment there may occur chances when the cheaque gets bounce. • Sometimes the customers address is very difficult to find and hence the items are not been dispatched on time and the blame comes on to the company. “To every coin there are two sides”, similarly, the project developed by me also has some limitations. 1. The user has to PRESS ENTER key when the page “CYBER SUITE SHOPPING” appears. 2. The user is not aware of the amount of the stock available in the store. 3. When the user buy something from one category, he cannot buy another thing from the same category i.e. if he buys from Chocolates Perk-3 he cannot buy fruit n nut with it, he has to go back to main menu and buy it via category Chocolates. 4. The users are unaware of the fact that on certain amount of purchases they will be given different gifts. After we have completed this project we are sure that the problems in existing system would overcome some of which are discussed before. The Internet shopping is computerized to reduce human errors and to increase efficiency. The focus of this project is to reduce human errors. The problems that existed in the original manual system have been reduced. It is expected that this project will go a long way in satisfying user requirements. After completing this project we gained a deep knowledge of C++. We also learned how to manage a project, how to analyze, design, test and debug the project.